A tiny island with a fascinating history, Pianosa forms part of the Tuscan Archipelago between Italy’s western coast and Corsica. It has a coastal perimeter of just 16 miles and the landscape consists of flat plains with the highest point being 29 meters. The Italian word ‘piana’ means ‘flat’ which refers to the island’s geography. The island’s population dates back to Ancient Roman times. Around 700 catacombs have been discovered which is the largest number north of Rome. Another landmark is the lighthouse on Pianosa’s east coast, which has been active since 1865. Napoleon visited the island in the 19th Century when he was exiled to Elba and was intrigued by its wildlife and vegetation. It is home to primarily hedgehogs, hares and an array of bird species. Pianosa is most notable for its ties to the penal system. In the 19th Century it was established as a penal colony where prisoners cultivated cereals, oils and wine. In the 1970s it developed into a maximum security prison used primarily for mafia bosses. It was closed in 1998 and although you can’t visit the prison itself, there is a museum showcasing its history. As part of the Arcipelago Toscano National Park, fishing, diving and anchoring are forbidden without authorisation. The island is restricted to 350 visitors each day and you are not allowed to sail within a one mile radius. Due to the number of restrictions, however, Pianosa boasts the most colourful ocean beds in the archipelago and an abundance of sea life including great pipefishes, striped mullets and lobsters. The island is unlike others of its kind, there are no shops and only one restaurant. However it has a peaceful atmosphere and the guided tours give you an opportunity to taste its unique history. 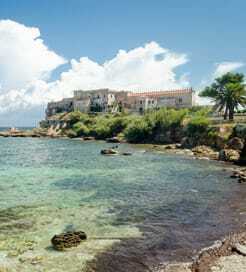 You can travel to Pianosa from Piombino on the mainland or from Elba, the neighbouring island in the archipelago. There is one journey a week from both ports with an average sail time of under 2 hours from Elba and a little longer from Piombino. Toremar operate a punctual service with comfortable ferries, carrying over 1.5 million passengers every year. For more information, please visit our Ferries from Italy to Pianosa Island page. For more information, please visit our Ferries from Elba to Pianosa Island page.